We just got in a huge shipment of Commodore and Amiga chips. Many of these chips are new, some are used. We hope to eventually provide better descriptions of each chip and which computer(s) they go with but for now all that we have time to do is to list them with the descriptions which we have provided. You may find useful information about these chips and part numbers by clicking here which will take you to an independent website which has extensive listings of Commodore chips, parts and part numbers. We can't accept any responsibility for any erroneous information on other websites but this particular external website seems to be quite accurate from what we can tell. Please let us know if you have any problems with this link. Please let us know if you find any errors or typos in our chip listings or if you have an idea what some of the chips are for that are just numbered but not described. We know what many of these chips are for and have indicated it on the list, but many of them are unfamiliar to us. We can't offer much assistance or answer many questions regarding these chips at this time unless you are contemplating placing a huge order of many of the same exact chip-- in which case we will try to help provide you with more details if possible. Note: Many other Commodore and Amiga chips may be found on our Commodore and Amiga web pages. We also have a large quantity of refurbished 64c (version e) motherboards which also have various chips included. Note: If you are contemplating a large purchase of chips feel free to make an offer to us if you don't like our prices. We may or may not decide to consider or accept your offer or make a counter offer. It is unlikely that any offer totalling under $150 will be considered. If ordering under $150 you will most likely need to adhere to the listed pricing. We strive to keep this list updated. If there are any shortages or discrepancies we will contact you after you place an order. 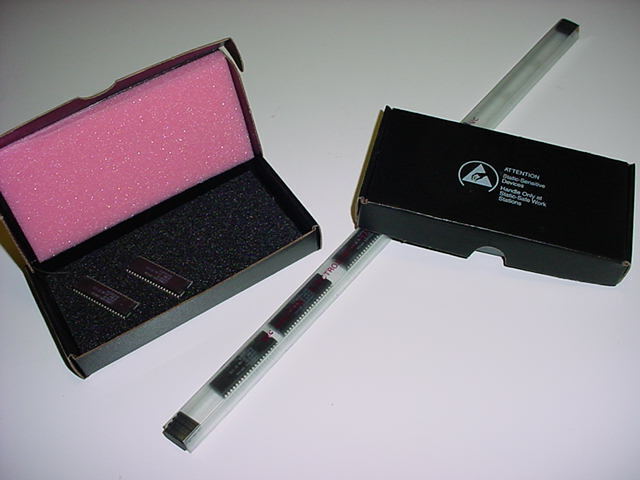 All chips are shipped in protective chip tubes or in protective static free boxes with black crisp anti-static foam. All chips have a 30 day guarantee unless otherwise noted or agreed to in writing. All prices and availability subject to change without notice. Current as of December 2010. Misc. chip sockets for Commodore New chip sockets available. See Commodore web page. Amber chip for Amiga. Appear to be pulls. Guaranteed. Ramsey chip for Amiga. Unsure if new or used. Super DMAC. Appear to be new. Kickstart v. 1.3 rom. New. Kickstart 2.04 Rom. New. May be pre-jumpered for certain boards. See 2.04 Kickstart information. Used Kickstart 2.04 Rom set ver. 37.175. Untested. ROM0 is the 390629-03 9204 D chip and ROM1 is the 390630-03 9149 D chip. Untested but in nice looking condition. 8520PD 8520 Amiga CIA chip New. 8520PD 8520 Amiga CIA chip New. Slightly newer version. MC68882, MC682FN25A Motorola 68882 processor. New. A2091 Rom (A-2091 Rom). New. D42101C (Video Rom or Ram?). New. FE 2010A, FE2010A by Faraday. New. VGA Bios for PC40. New. New. Commodore 128 BASIC rom? New. Combined kernal rom U.S.? 40 column U.S. character rom for Commodore 128. New. German character rom for Commodore 128. New. 8563R9, 8563-R9 Commodore 128's 80 col. video chip. New. 6502, R6502, R6502AP, and/or 6502AD. New. CPU chip for Commodore Vic-20 and 1541 disk drives and other early 8 bit computers and devices. Dos rom for 1541 disk drive. New. 2364 $C000 DOS rom for 1541 drives with short boards. New. 64C22P-2 and 65SC22P-2. New. May be same as 6522. 6522 CIA chip. Used pulls. 6526 CIA chip (U1 and U2) for Commodore 64. Also used on Commodore 128. New. Frequently needed repair if joystick port, keyboard, or user ports malfunction. Slightly imperfect looking. Possible slightly bent legs and/or cosmetic flaws but guaranteed (excluding abuse and static electricity damage). 6526 CIA chip (U1 and U2) for Commodore 64. Also used on Commodore 128. New but imperfect. May have noticeably bent leg(s) and/or cosmetic flaws but still guaranteed (excluding abuse and static electricity damage). Frequently needed repair if joystick port, keyboard, or user ports malfunction. 6526 CIA chip (U1 and U2) for Commodore 64. Also used on Commodore 128. Used pulls from used Commodore 64 computers. Untested. These were removed from units which had problems not usually related to the 6526 chip. May have slightly bent leg(s) and/or cosmetic flaws. Frequently needed repair if joystick port, keyboard, or user ports malfunction. AS IS or $21 guaranteed. $15 AS IS or $21 guaranteed. Tested used sound chip for Commodore 64. We put warranty stickers on these. Warning: If you have your monitor's video and sound cable reversed you may blow out good sound chips! $37 ea. AS IS or $49 ea. with 10 day guarantee. Tested used sound chip for Commodore 64. Work fairly well but may have slight sound anomalies or paddle control problems. We put warranty stickers on these. New or like new. Some may be pulls but are guaranteed. Some have part number 906114-01 or 82S100 or 82S100N or N82S100N. Specify preference if any when ordering. Often the problem when no picture. 8564-R4, 8564, 8564R4 Commodore 128 and 128d 40 column VIC video chip (NTSC). Newer version also available below. New. 5719. New. Gary chip for Amiga? Commodore PC40 Bios. Board location U1102. 28 pin. Appear to be Eproms. Might be re-programmable. Call for more information. Specify version preference-- if any. New. Used Commodore 128 U33. BASIC LO ROM? Intel 80286-12 CPU. May be pulls. 3010B or FE3010B. New or pulls. Faraday FE3020 or 3020. Look new. Faraday FE3030 or 3030. Look new. 390306-01 ? or 310341-01 ? 5720. Unsure if new or not. 6510 Commodore 64 CPU. New. 6567 R8 (6567R8) video chip for Commodore 64. New but may be slightly blemished and/or have very a very slightly bent leg or two. 6567 R9 (6567R9) video chip for Commodore 64. New. Probably sold out. Character rom for Commodore 64. Used. BASIC rom for Commodore 64. New and Used. $13 new or $7 used. $10 new or $6 used. Commodore 64 kernal rom. Look new. 8701 Commodore 64 IC Clock generator. Look like new but might be pulls. 8500 CPU for Commodore 64c units with narrow (revision E) board. Look new. sold out except for those installed in the refurbished 64c boards which we offer. 8562 rev.4 8562R4 video chip for Commodore 64c units with narrow (revision E) board. Pulls. BASIC/Kernal U4 rom for 64c (revision E) boards and/or 128? New. Same as above except Used. New ASIC U8 chip for Commodore 64c units with narrow (revision E) board. New. 8502 (8502R0). New. 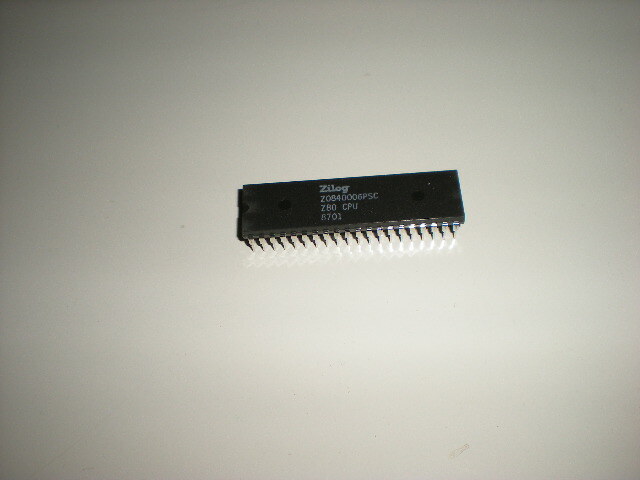 CPU chip for Commodore 128. 8564 R6 Commodore 128 and 128d 40 column NTSC composite video chip. New. 8568 80 column video chip for Commodore 128D. New. 8721 R3 (U11 chip for Commodore 128). New. 8722 R2. (U7 chip for Commodore 128). 8565 VIC II PAL (Actually 8565R2) for Commodore 64c version E (narrower) boards. New. 256x1 41256 ram (256 x 1) New. Some 41256c-80 and some 21256-08. Specify preference if any. Bridgette. Looks new but a few of the chip legs on each chip have been bent somewhat due to improper handling before we received it. We think that with enough precision that the legs might be straightened out sufficiently to allow the chip to function but we are not sure. We are selling this chip AS IS now with no return or refund option. U1101. PC-40 chip? Probably new. Possible 28 pin Eprom.